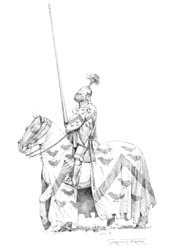 A selection of prints reproduced on good quality heavyweight paper from pencil drawings of armour by Graham Turner, bringing to life the knights and men at arms of the Wars of the Roses based on evidence from sources such as memorial tomb effigies and brasses and manuscript illuminations. 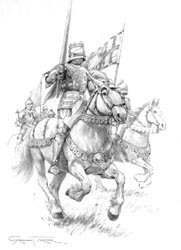 Richard III leads his household knights and retainers in their charge towards Henry Tudor, at the height of the Battle of Bosworth on 22nd August 1485. Reproduced on good quality heavyweight paper from a pencil drawing by Graham Turner. Print, reproduced on good quality heavyweight paper from a pencil drawing by Graham Turner. 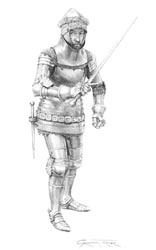 English armour c.1415, in the latest style worn by the wealthier English knights at the Battle of Agincourt. 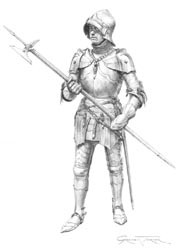 Jean, Sire d'Aumont, prepares for the initial French cavalry charge against the English flanks at the battle of Agincourt, 25th October 1415. CLICK HERE to see currently available original pencil drawings by Graham Turner.